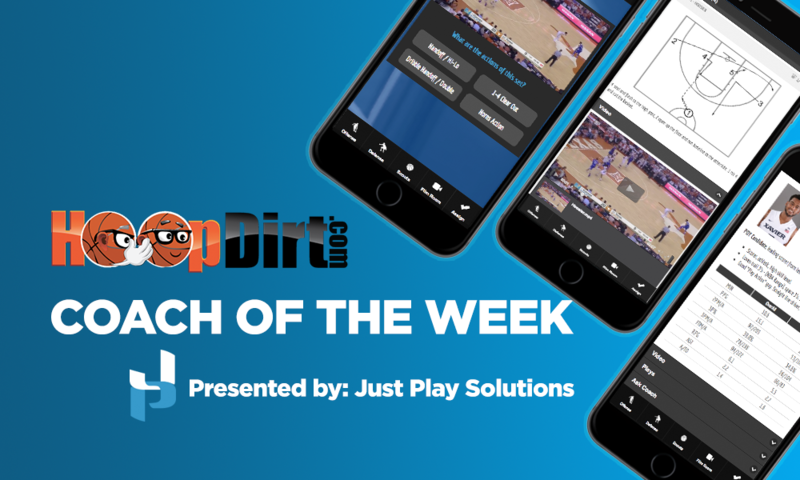 Congratulations to the following coaches who have been selected as the Week 2 HoopDirt.com Coach of the Week presented by Just Play Solutions. The coaches are now eligible to receive the HoopDirt.com National Coach of the Year Award presented by Just Play Solutions which will be announced at the conclusion of the 2017-18 college basketball season. Coach Moser’s Loyola squad continued their hot start to the season this week, going 3-0 with two big wins at the Savannah Invitational. This moved their record to 7-0 – their best start during Moser’s tenure at the school. The Ramblers began the week with a 63-50 victory over Mississippi Valley State, and then came away with two impressive victories at the Savannah Invitational. They defeated UNC Wilmington 102-78 on Friday and downed Kent State 75-60 on Saturday. Loyola Chicago will look to remain undefeated as they travel to play Boise State on Tuesday. Bronkema’s 5th ranked Bulldogs came away with two hard-fought victories this week, including a last-second win over nationally ranked University of Findlay. Ferris State entered the week with an impressive 6-0 record, and improved on that with a 99-84 win over Olivet College on Tuesday. The Bulldogs then went on to face 18th ranked Findlay, who had eliminated them from the NCAA Tournament last year. A basket by senior Noah King with 1.1 seconds remaining gave Ferris State the victory, and pushed their record to 8-0. They are back in action on Thursday in a conference match-up against Tiffin University. The University of Puget Sound, led by Coach Justin Lunt, capped off a 3-0 week with an impressive 87-74 road win over 15th ranked Claremont-Mudd-Scripps. This win improved the Loggers’ record to 6-0 – a mark that is already half of last year’s total victories for Lunt’s squad. Other victories for Puget Sound this week were a 116-115 back-and-forth thriller over the University of Redlands and an 89-84 defeat over Pomona-Pitzer. The Loggers face off against preseason #1 Whitman next as conference play begins on Friday. Adkins and the 9th ranked Running Eagles went 3-0 this week, and defeated Dalton State in a thrilling top-10 match-up. Life University never held a lead in the second half, but fought back from an 8-point halftime deficit to take 6th ranked Dalton State to overtime, where they eventually emerged with a 72-71 victory. After this win, Life went on to defeat Morris College 103-67 and Thomas University 78-74. This marked the sixth straight victory for the Running Eagles, and improved their record to 7-2 on the season. They will look to continue their winning streak on Friday against Talladega College at the Dillard Classic. Coach Tuley’s Trojans defeated 3rd ranked South Plains College en route to an impressive 4-0 week. After winning their first two games of the week, Seminole State headed to the Collin County Thanksgiving Classic, where they rebounded from a 14-point second half deficit to stun #3 South Plains 84-77. The Trojans then defeated Collin College 68-63 to move to 9-2 on the season. Seminole State look to extend their winning streak to six as they take on Eastern Oklahoma State College on Tuesday.